Atsushi Nishijima explores sound and music from diverse perspectives, and presents performance, sound installation, and two and three-dimensional work based on the acquired knowledge and matters in everyday life. In his major performance piece Acoustical Scenery, Nishijima arranges a series of candles on graphic notations he made based on “chance operation,” one of John Cage’s methodologies of “Chance Music,” and uses light sensors to transcribe the variously caused fluctuations of flames which result in the emergence of organic fields of sounds. Ito Mono Stroke is a painting on a kite string, which Nishijima perceives as a minimum unit of canvas, depicting randomly selected colors and lines on the theme of anonymity of sounds and brushstrokes. 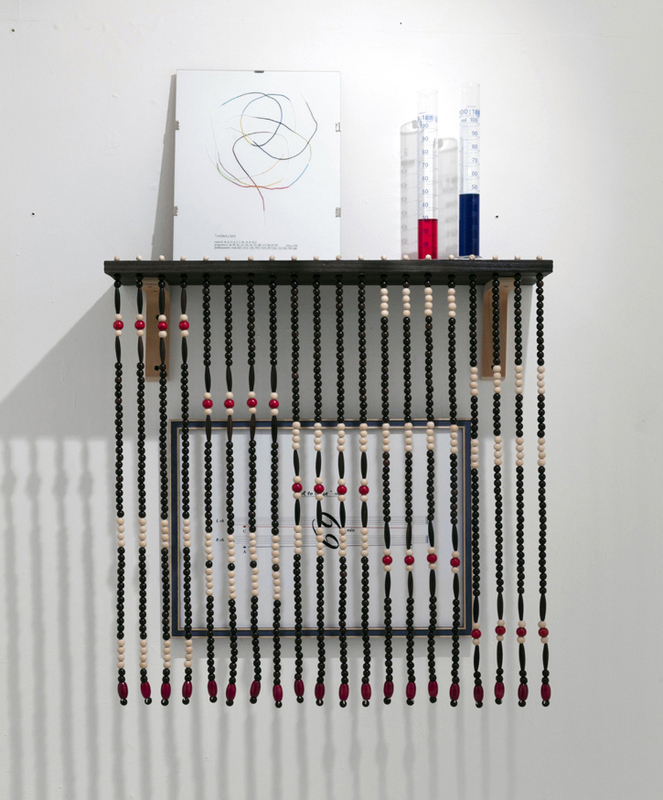 The piece entitled Turner Curtain, inspired by “boundary stones” or “musicircus” (a mode of expression where diverse things are performed simultaneously, originally conceived by John Cage), encourages us to understand the way we perceive a certain space through means of a three-dimensional boundary created by ordinary daily objects such as a beads curtain and a shelf. Nishijima’s works present a contemporary interpretation of the practice and essential humor of Fluxus, which served to blur the boundary between art and life. This marks Nishijima’s first solo exhibition at 8/ ART GALLERY/ Tomio Koyama Gallery, and features new works as well as major pieces from his artistic career. Atsushi Nishijima was born in 1965 in Kyoto. He received his Bachelor’s degree from the Osaka University of Arts in 1989 and graduated from the International Academy of Media Arts and Science in Gifu in 2001. He stayed in New York with the Asian Cultural Council fellowship in 2001, as well as in Berlin in the Program of Overseas Study for Upcoming Artists by the Japanese Government’s Agency for Cultural Affairs in 2014-2015. He has presented work in numerous exhibitions including “Citycircus” (New Museum of Contemporary Art, New York, 1994) and “For Missing O ‘KYTO’” (Tomio Koyama Gallery Kyoto, 2011). Nishijima also organized “John Cage 100th Anniversary Countdown Event” (The National Museum of Art, Osaka, and other venues) through 2007-2012. He has performed with various artists / composers including Takehisa Kosugi, Yuji Takahashi, Aki Takahashi, Carl Stone, Nobukazu Takemura, HACO, and Yamataka EYE. He presented his work in “Japanese Connections” at Nikolaj Kunsthal in Copenhagen from June to August 2017.